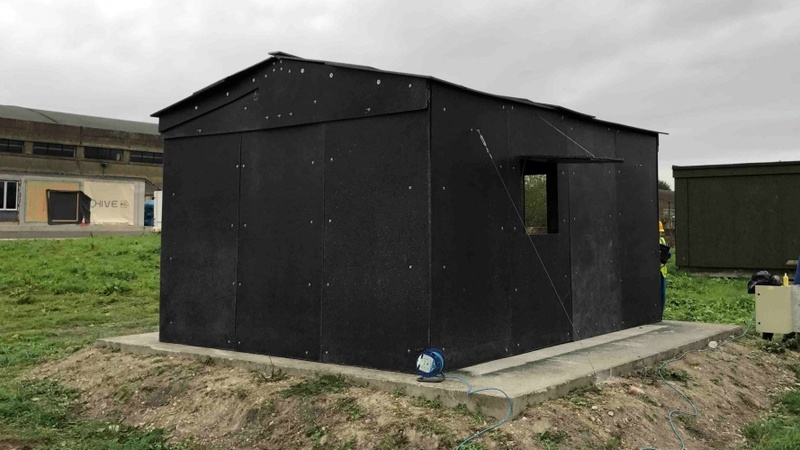 Researchers at the University of Bath and plastics company Protomax have developed a new type of flat pack storm shelter made from recycled waste plastic. Known as Storm Board, the system could provide protection for people whose homes have been destroyed by natural disasters such as the recent hurricanes that hit parts of the US and the Caribbean. Each shelter measures 3.6 x 4.8 metres, and several units can be linked together to form larger structures. According to the researchers, the panels are made from a variety of waste plastics including those that pollute the oceans, and could even be produced on-board a ship as it removes waste plastic from the sea. “From the milk bottles to the ice-cream tubs we throw away each day, these waste plastics could provide a recyclable shelter solution to those people who have been left without a home,” said David Coley, Professor of Low Carbon Design at the University of Bath, and the project’s lead researcher. The panels can be easily stored for decades then transported in flat pack form on pallets. 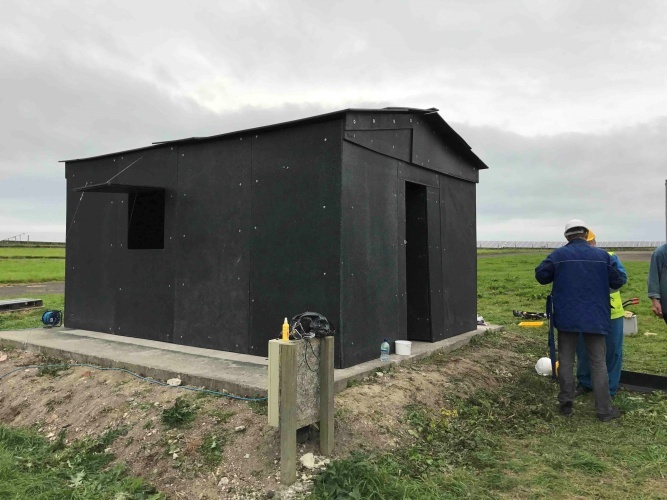 As well as being manufactured from waste plastic, the shelters themselves are recyclable, and can be either reprocessed or reused once they are no longer required in a given situation. The Bath researchers are currently testing the performance of Storm Board at the University’s Building Research Park in Swindon, where the material‘s ability to provide adequate shelter in winter weather is being examined. “The weather proof boards provide a level of insulation and security that a tent simply cannot achieve,” said Nico Stillwell from Protomax. I was wondering what was wrong with using old-school corrugated metal sheets – last forever etc. until I read the bit about insulation. Got it! Actually they don’t! They rust away, and are heavy. As evidenced at many locations in Scotland! Is the concrete base also flatpack? It’s often the only part left of the building that was razed by the earthquake/tsunami/hurricane so already in situ. Interesting use of waste plastic, probably depends on the value that we eventually place on such recycling to become viable. However, there is a clear and massive need for rapid housing in emergency situations and the weather-proof nature of plastics and durability will be great benefits. One problem that I see is heating / cooking in a plastic building, especially in third-world applications where open fires are used. In some countries I have seen the 40′ containers, commonly used in shipping, made into very useful accommodation, we sometimes use these in the UK for site offices / stores. Perhaps a simple steel support structure could allow the avoidance of concrete bases, mentioned by Clive Davis, as these are not available in emergency applications, and could strengthen the floor. Some years ago I was asked to contribute to a new design of ‘drop-bags’ that are ‘ejected’ from the rear of a plane, flying literally a foot or so above the ‘landing point’: there are many occasions when an actual landing is unsafe and extremely hazardous. Of course a traditional ‘polypropylene sack’ as used before will invariably split on impact and the contents will scatter: it was not critical, because there were many hungry hands ready to collect the scattered food-stuff (rice, maize) -but the new design used what is termed ‘partially drawn’ filaments (often in the form of very narrow tapes) that were woven and then made up into bags. On impact, these had some residual ‘give’ in the filaments and hence fabric: and this permitted most of the contents to be retained in the bags. I wonder if there is some mileage in considering a similar approach to the materials used to construct these temporary houses. Materials with some residual ‘draw’ so that if and when stressed, (by wind, storm, etc) they would extend that small amount necessary to retain most of their structural integrity. Just a thought?